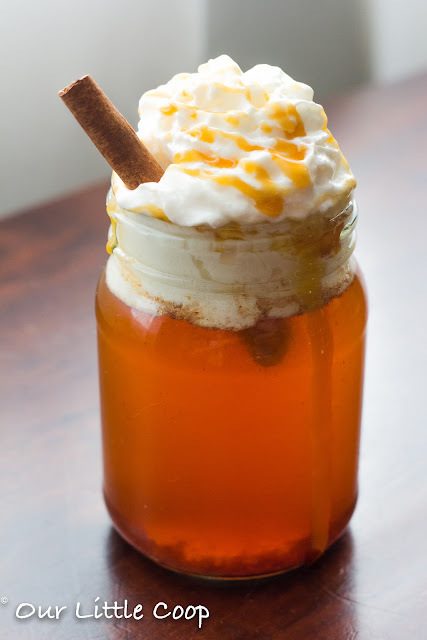 I fell in love with Starbucks Caramel Apple Cider quite a few years ago when I was pregnant with our daughter Autumn, and this recipe is the real deal folks! With just a few simple ingredients you can now enjoy a delicious Starbucks beverage at home for a fraction of the cost!! You will never taste the difference because this is actually how they make it! 3 Tablespoons of Starbucks Cinnamon Dolce Syrup $9.95 for a 1-liter bottle (thats A LOT of syrup) or you can make your own by creating a simple syrup of 1/2 cup of light brown sugar, 1/2 cup water and 1 tablespoon of cinnamon. Simmer in a small saucepan until brown sugar has dissolved. Use 3 tablespoons of this as well. Nice ! Bookmarking this for sure ! Gorgeous photo too. Oh wow! I was just deciding whether I wanted to try this instead of my normal mocha I get once a week on the way to visit grands. If you buy their syrup it only adds up to about 2 of their special drinks would be wll worth it. Do you buy it at the coffee shops?